Why should you visit the Dazu Rock Carvings? The Dazu carvings represent the pinnacle of Chinese rock art for their high aesthetic quality and their diversity of style and subject matter. Tantric Buddhism from India and the Chinese Taoist and Confucian beliefs came together at Dazu to create a highly original and influential manifestation of spiritual harmony. The eclectic nature of religious belief in later Imperial China is given material expression in the exceptional artistic heritage of the Dazu rock art. Add world heritage to your travel plans – plan to visit Dazu Rock Carvings! Sign up on GoUNESCO to get travel advice, tips, partners and help with traveling to Dazu Rock Carvings. 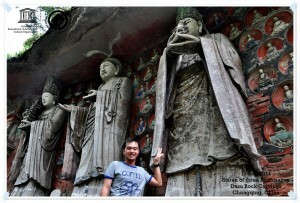 Have you been to Dazu Rock Carvings? Know any events coming up at Dazu Rock Carvings?